[154 Pages Report] The hybrid cloud market size is expected to grow from USD 38.27 billion in 2017 to USD 97.64 billion by 2023, at a Compound Annual Growth Rate (CAGR) of 17.0% during the forecast period. The base year considered for this study is 2017 and the forecast period is 2018–2023. The hybrid cloud is rapidly becoming a leading cloud solution, as it provides various benefits, such as cost, efficiency, agility, mobility, and elasticity. Enterprises are leveraging the hybrid cloud model to eliminate business challenges that are difficult to address with traditional IT infrastructure. Hybrid cloud is bridging the gap between IT and businesses by improving agility and efficiency as well as by rapidly delivering IT resources at a low cost. It empowers enterprises to extend their applications and infrastructure as required, and offers users with high-speed performance and high availability. Hybrid cloud provides economies of scale and at the same time offers security to sensitive information of the businesses. As the availability of secure, scalable, and cost-effective resource can provide organizations with more opportunities to explore different operational avenues, it will drive the adoption of hybrid cloud environment among organizations. The hybrid cloud ecosystem include vendors, such as IBM (US), Microsoft (US), Cisco Systems (US), AWS (US), Oracle (US), Google (US), VMware (US), Alibaba (China), Equinix (US), Rackspace (US), NetApp (US), Atos (US), Fujitsu (Japan), CenturyLink (Louisiana), HPE (US), DXC (US), RightScale (US), Micro Focus (US), NTT Communications (Japan), Dell EMC (US), Citrix (US), Pure Storage (US), Unitas Global (US), and Quest Software (US). The other stakeholders of the hybrid cloud market include systems integrators, application designers and development services providers, and network services providers. In June 2018, Microsoft acquired GitHub, which is a leading software development platform provider. This acquisition would empower developers to achieve more at every stage of the development life cycle, accelerate the enterprise use of GitHub, and bring Microsoft’s developer tools and services to new audiences. In May 2017, IBM acquired cloud and managed hosting business of Verizon. This acquisition is expected to augment IBM’s cloud business. What are new verticals which the hybrid cloud companies are exploring? The hybrid cloud market is expected to grow from USD 44.60 billion in 2018 to USD 97.64 billion by 2023, at a Compound Annual Growth Rate (CAGR) of 17.0% during the forecast period. The demand for hybrid cloud is expected to be driven by several factors, such as cost efficiency, scalability, agility, and security. Hybrid cloud bridges the gap between Information Technology (IT) and businesses by improving agility and efficiency, as well as by rapidly delivering IT resources at a low-cost. 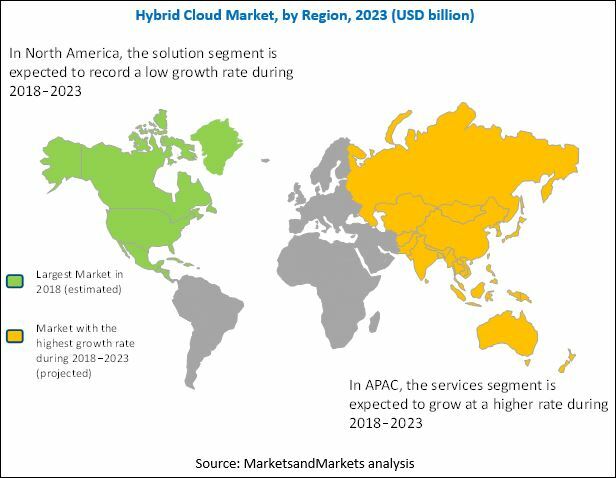 The hybrid cloud market has been segmented on the basis of components (solution and services), service types, service models, organization size, verticals, and regions. The services segment is expected to grow at a higher CAGR during the forecast period, and the solution segment is estimated to hold a larger market size in 2018 in the market. The adoption of the hybrid cloud among enterprises has become a central part of the business process, due to the high flexibility, enhanced scalability, low cost, and secured deployment options, and is expected to grow in the coming years. The hybrid hosting segment is estimated to hold the largest market size in 2018, as it offers numerous benefits, such as access through a single point of contact; sharing the network infrastructure; and monitoring, delivering, and managing hosting services. Organizations are enhancing their ability to integrate co-location, dedicated servers, and virtualized environments to construct a hybrid hosting environment. The Infrastructure-as-a-Service (IaaS) segment is expected to hold the largest market size during the forecast period. IaaS helps in transferring workloads from on-premises systems to the cloud during the peak demand. This advantage helps allocate resources for more important business processes. Organizations can enhance their performance, increase delivery speed, improve productivity, and provide flexible computing capabilities, both in the public and private cloud environments. North America is estimated to hold the largest market size in 2018, whereas Asia Pacific (APAC) is projected to grow at the highest CAGR in the hybrid cloud market during the forecast period. Hybrid cloud deployment has become the most suitable solution for organizations across all regions. The major factors that would further drive the growth of the hybrid cloud market are the presence of a dynamic business environment, increasing adoption of multiple cloud services for cost savings, and an indispensable need to achieve better productivity and efficiency through centralized cloud governance. The BFSI vertical faces numerous challenges such as regulatory pressure, fierce competition, and stringent internal Service Level Agreements (SLA), among others. BFSI companies focus on reducing back-office costs through optimization and better operational procedures. Moreover, they have reduced the focus on non-core functions by outsourcing them, thereby resulting in greater focus on core competencies, reduction of risks, enhancement of customer relations, and improvement in regulatory compliances. Enterprises in the BFSI vertical are turning toward the hybrid cloud computing solution to overcome these challenges. The amount of data processed in this vertical is substantially huge and requires superior-quality storage solutions and services. Thus, it is necessary to have highly optimized IT infrastructure that provide business efficiency and operational stability. The telecommunications and ITES vertical is under constant pressure to increase the availability and quality of connectivity. Another hindrance in the telecommunication industry is the increased risks of hacking and malware. The hybrid cloud solution aims to provide secure services and meet the regulatory compliance in the telecommunication industry by offering database security management, email protection, security breach prevention, and many other benefits. In the past few years, healthcare companies have expressed substantial interest in the adoption of cloud computing technologies. Earlier, the healthcare technology infrastructure was managed in-house behind strong firewalls. As the cloud emerged, the sector learned from other verticals, such as BFSI and retail, in terms of adopting cloud for better business agility along with data security. Moreover, with rising technological requirements, this vertical faces several challenges, such as maintaining the privacy of Electronic Health Record (EHR) and meeting various industry compliances. Hybrid cloud capabilities can help healthcare organizations by supplementing the existing capabilities and enabling scalability and flexibility. The rising need for more computational power and rapidly increasing adoption rate of the hybrid cloud are expected to open new avenues for the hybrid cloud market. Major players in the hybrid cloud market are IBM (US), Microsoft (US), Cisco Systems (US), AWS (US), Oracle (US), Google (US), VMware (US), Alibaba (China), Equinix (US), Rackspace (US), NetApp (US), Atos (US), Fujitsu (Japan), CenturyLink (Louisiana), HPE (US), DXC (US), RightScale (US), Micro Focus (US), NTT Communications (Japan), Dell EMC (US), Citrix (US), Pure Storage (US), Unitas Global (US), and Quest Software(US). These players have adopted various growth strategies, such as new product launches, mergers and acquisitions, partnerships, collaborations, and business expansions, to expand their footprint in the hybrid cloud market.